I'm still working on a thesis on the South European short swords of the Hallstatt to La Tène period. These are in the center of the diagram with the angled grip and short angled blade that continues either triangular, curved or straight. All in my opinion share the characteristic of being good stabbing weapons and not so good choppers. 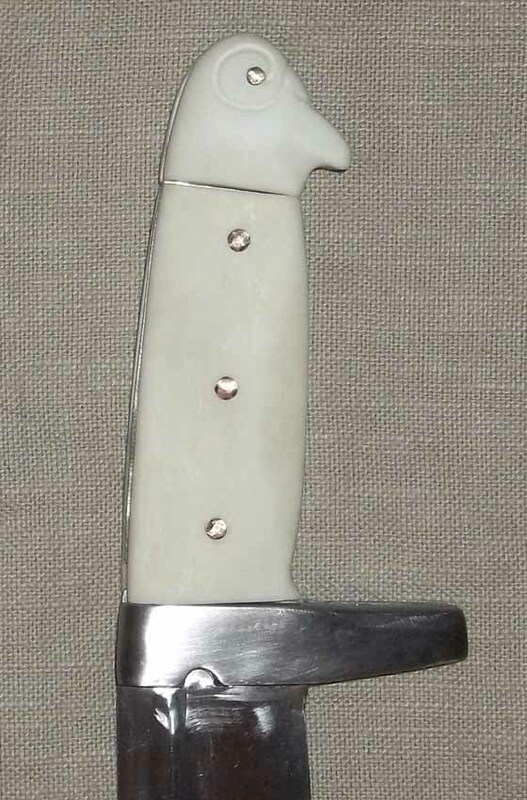 The depicted falcata by contrast sacrifices balance for stabbing in order to improve the cutting and requires shortened length to be handled in skillful moves. The Greek swords called kopis or machaira (modern definition what is what) clearly diverge from the Balkan weapons by their weight and cutting emphasis while not being angled like a falcata (another modern name). You can be certain that men trained with weapons from the Iberian Peninsula had contact with men trained with Greek weapons, so we can not rule out a direct contact effect upon each other because a body of water was less of a distance than a piece of land. The La Tène (Celtic????) curved knife is always a knife and is has to my knowledge never been enlarged to sword size and it has a very clear connection with eating meat (including the afterlife). So I would go with the falcata being an expression of the cutter swords circulating in the Mediterranean and I would not postulate a single source nor region. At least I agree with the diagradiagram far that the Balkan stabbers had little in common with the cutters, but i would also say that these stabbers have but a faint connection to the curved knives. I'd suggest that you check carefully what I said on the origins of the falcata in the original source where all these ills. are taken from and hopelessly mixec, and check the original text, tables, maps and drawings there. The lines of the falcata are beautiful to me. My ancestry is Cuban and the ancestors of those cubans are Asturian and Basque, so northern Spanish. My father regaled me with the ability of my great grand father with a machete against sugar cane and Spanish mausers. My father always said the family heritage had seen the falcata as the ancestor of their machetes. Living in the U.S. I have had such romantic dreams of the falcata and it's beauty that eventually I got motivated. The hole in the blade and the grip are bolt holes where the steel was bolted to the truck shovel. My intention is to fill the hole in the blade with a bronze bolt that I finish off with an engraving of Lauburu a symbol on each side. The notch in the hilt will be filled with a brass ring and a wood grip. Attempting at all times to the idea of being a Universal Man. In regards to the Dacian artifacts, firstly I don't know the period, I think the Sickle shaped one is a sica or possibly a falx, but not like a Rhomphaia, because falx had wood handles without metal in the whole handle and the curve of falx varies so much but probably a sica. There are many possible Dacians not knowing the period, possibly Getic-Dacian. I think what appears to be a sax is a broken sword similar to Celtic if 3rd Century BC but believed to be independently designed. Basically a double-edged long-sword. The curved spear tip is new to me but is typical in design for the region since they curved most anything possible. Some other tips could be spears and some for peltasts use like javelins. They sometimes used wide tips in throwing. There are other sub-Dacians as well. Strike hard, strike fast but only strike when necessary. There is no sources I know of saying falcata is effective against armour and when I saw a falcata in a museum it definitely didn't look like an anti armour weapon. It's a slasher made for cutting flesh and cloth. All talk about falcata's armour cutting ability come from one source, a mention in ceasar's writings how he met a soldier who had his head wounded through a helmet with a spanish sword. We don't even if know that spanish sword was a falcata. And the man lived so even though he was wounded, his helmet did the job and saved his life. Exactly what Luka said. Ancient swords were never meant to go *through* armor, they were made to go *around* it. So they were light and fast. The kopis was no heavier than any other sword of the same general length. Hey, I need to post a photo of my own new kopis! I finished it recently, ground down out of a rather crude 3-pound beast (Scorpion Arms, I think?). Finished weight is under 1-1/2 pounds. I was able to pretty much match the shape of a blade from Olympia, and based the bone hilt on one from Aigai in Macedonia. Do you have any idea how much energy is necessary to stab through well-wrought mail? What kind of math or experience with original quality armament are you basing your conjecture on (hard to do, considering almost no orignal ancient mail armor even exists). In any case, compared to contemporary straight swords such as the xiphos and gladius, a bit of extra weight in a blade makes very little difference in a stabbing attack. In fact, I would almost certainly prefer to use a straight bladed weapon for almost any form of thrusting compared to one shaped like a kopis/falcata. The weapon's entire form - as well as many surviving Greek pottery depictions of the kopis in use, often in overhand swings - lends credibility to the idea of it being a slashing weapon rather than one for thrusting. Having seen a couple of surviving Greek kopis blades in Greek museums, I can assure you those weapons were hardly any larger than a xiphos. In fact I've seen several xiphos from Macedonian tombs that were surprisingly large and definitely heftier weapons than either of the kopis blades that I viewed. I have less to say about the later Spanish falcata, which is apparently a bit of a larger weapon, though its contemporaries the gladius and spatha were also substantially broader/longer than their Greek counterpart in the xiphos. Whether there was any serious difference in the way that a falcata performed due to its weight or the distribution of that weight along the blade is hard to say with any exactness. Its basic functions would have been the same as other mid-length blades, and perhaps even more limited to slashing rather than stabbing, due to the above mentioned restrictions of the blade shape. What weights have you seen for falcatas? All of the weights I've seen (not very many) have been 600-650g. Thanks for replying and the weights i have seen were 900-1300 gramms. I have never personally tried stabbing throw mail and I agree that the falcata was mainly a hacking weapon. Yet I have seen many documentarys and tests were a blade apparently thrusts throw mail with ease. You can see it in almost all documentarys about medieval and roman weapons. Almost no one today makes historically accurate mail armour. Even modern riveted mail tends to be substantially flawed for a variety of reasons. The modern documentaries are highly unreliable, because their mail armour is much easier to defeat than mail made to historic standards. Thanks for replying and the weights i have seen were 900-1300 gramms. That's very heavy for swords of that size. Considering that falcata blade cross-sections are typically weight-saving, those seem too high. Many of these are missing grip scales. Original weights would have been a little higher in most cases. I don't know anything about the kopis/falcata beyond what I have read in this thread. What I am wondering is if there are any Greek kopises (kopi?) made from bronze (i.e. 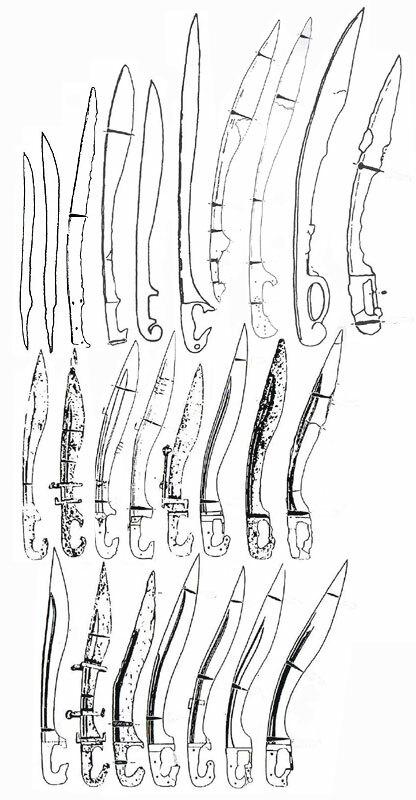 bronze age weapons). From what I have read in this thread so far, my impression is "no". As far as I'm aware, the answer to your question regarding the existence of bronze kopises is a resounding "no." 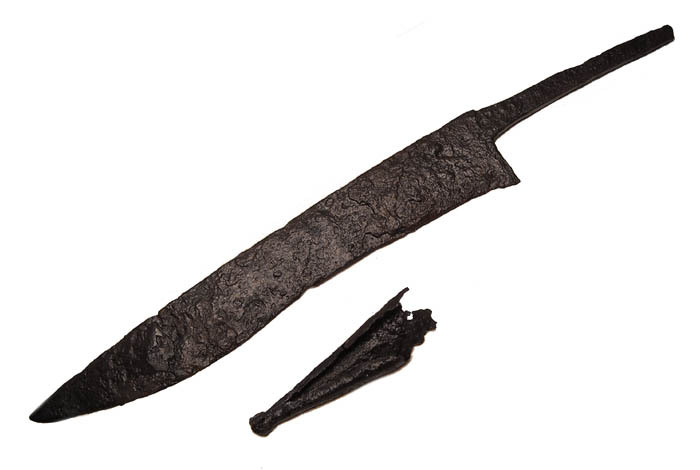 However, there were some interesting single-edge bronze weapons used in the LBA throughout Europe, though their form and size is not comparable to the kopis, so there is no reason to suspect any evolution between such weapons and those of the iron age. 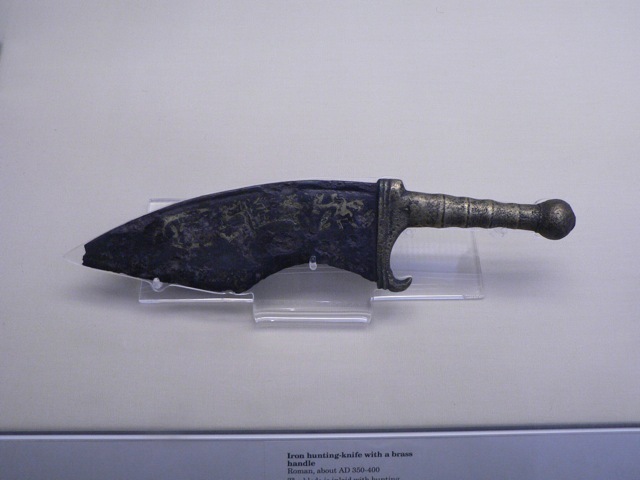 The earliest evidence we have of the kopis is roughly three hundred years after iron began to dominate the scene of Mediterranean blade technology. Cheers! There are some bronze implements that are single-edged, with long round-section grips that end in a ring or loop. The whole thing is apparently cast in one piece, without anything that looks like a guard. I haven't seen any information on weights or thicknesses for these things, but I suspect they are cleavers meant for sacrificing animals. Ah, found a photo! In any case, I don't *think* this could be a predecessor for the kopis. BUT there are some iron kopis-like blades that seem to be rather heavier, and have what seem to be thick rod tangs, or a thick square (diagonal) hilt/grip. Again, I'd call these "cleavers" and not swords. Some kind of cleaver, perhaps these exact things, are seen in vase paintings, being used to kill animals, not in combat. Bottom line, although there might be some relation between the cleaver-tool and the kopis-weapon, it may only be superficial. And only the cleaver has a known Bronze Age ancestor. Byzantine (Eastern Roman) 6th - 14th Cent. A.D.